Find out how to log in to the campus CMS. You must be provisioned in the CMS before you can log in. Using a recommended Web browser, go to http://cms.ucsd.edu. Log in using your Business Systems (SSO) username and password. Sessions are 8 hours long. In other words, you will be automatically logged out after 8 hours of inactivity in the CMS. 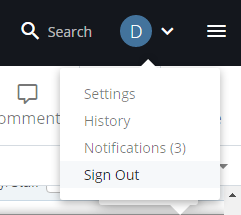 To manually logout, click on your profile image in the upper right hand corner and then click Sign Out. The campus CMS is a web-based application accessed through a web browser. We recommend a display capable of 1280x1024 or higher for full desktop resolution. Tablet and mobile resolutions are also supported.